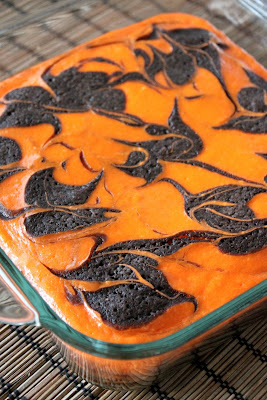 Cream Cheese Swirl Halloween Brownies and we have a winner! These brownies really did not take much creativity on my part. I used the recipe for the Red Velvet Cream Cheese Swirl Brownies I made last November, but instead of adding red food coloring to the brownie base I added orange food coloring to the cream cheese part. I think they are super adorable for Halloween and the coloring could be changed up for any Holiday. I also added some black food coloring to the brownie part, but clearly did not add enough as it turned out dark brown. Still works for Halloween either way. 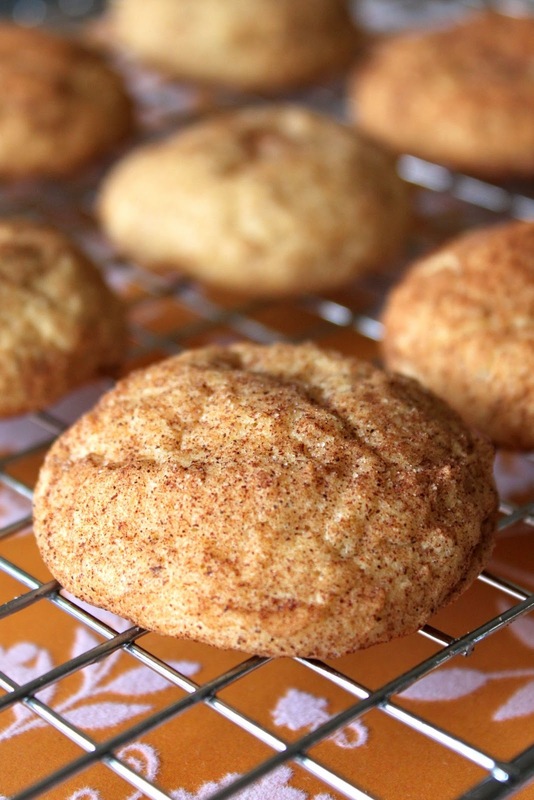 "I can't wait to make pumpkin snickerdoodles. Great giveaway. Shabby Apple has a fantastic line." Brownie layer: Add melted butter to a large bowl and add the sugar, vanilla, cocoa powder, salt, warm water, and vinegar, in that order, mixing between additions. Whisk the eggs in a small bowl and stir it into the cocoa mix. Fold in the flour until lightly combined. Pour the batter into the prepared baking pan, saving 1/4 cup of the batter for the top. Cream cheese layer: Blend together the cream cheese, sugar, egg, vanilla, and food coloring in a medium bowl. Gently spread the cream cheese layer on top of the brownie batter in the pan. Dollop the remaining brownie batter over the cream cheese layer. Using a skewer or the tip of a knife, drag the tip through the cream cheese mixture to create a swirl pattern. Bake the brownies for 30 minutes. Remove to a cooling rack and allow them to cool completely before cutting. For those of you who know me well, you know I love cereal and am a creature of habit. I eat Honey Nut Cheerios mixed with Smart Bran and Cinnamon every single morning for breakfast. I stock up on extra boxes of Honey Nut Cheerios so I never run out. If there is ever a morning when I do happen to run out I am typically not a happy camper...unless there is a tasty replacement around such as these muffins. These are the perfect Fall or Winter muffin. I made these last winter and have been patiently waiting to share them with you. Fresh cranberries are going to start popping up at the grocery stores and I wanted you to be armed with this tasty muffin recipe. Of course frozen cranberries are also an option. 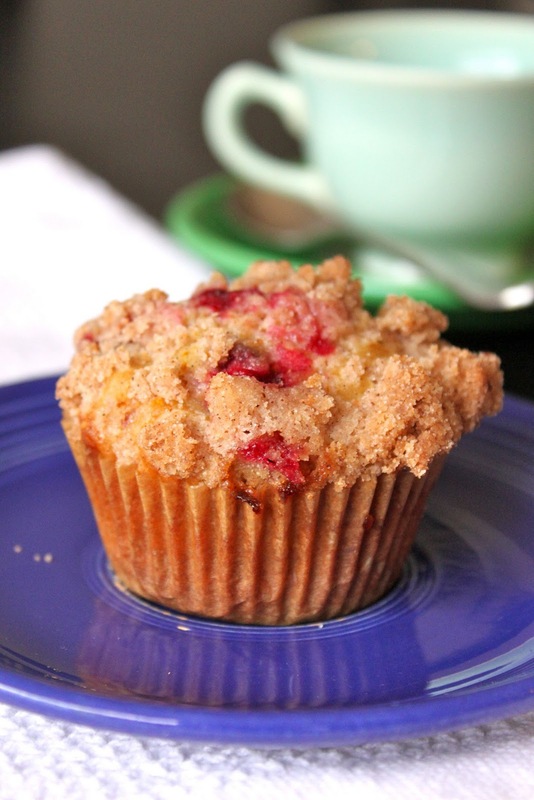 These muffins are the perfect balance of sweet and tart. Definitely perfect for the season. In other news, don't forget to enter my Giveaway and for those of you who are counting this is my 200th post! In a medium bowl mix together flour, salt, baking soda, cinnamon, and orange zest. In a large bowl beat together eggs, white sugar, and brown sugar. Mix in oil, vanilla, and sour cream. Mix dry ingredients into wet mixture (be sure not to over-mix, batter will be lumpy). 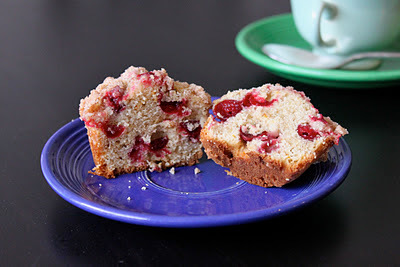 Gently fold in cranberries. Scoop batter into prepared muffin cups so they are 2/3 of the way full. To make the topping: mix together 1/2 cup sugar, 1/3 cup flour, 1/4 cup butter, and 1 1/2 teaspoons cinnamon. Crumble with fork, and sprinkle over muffins before baking. These cookies are getting around lately. I made these cookies a couple weeks ago and clearly I am not the only blogger to make them this Fall. I was inspired by the post on Sweet Pea's Kitchen who was inspired by Recipe Girl, barley adapted from Cook’s Illustrated, February, 2005. In the past week though I have seen them pop up on at least three sites. There is very good reason for this....these cookies are delicious! If you like pumpkin and you like snickerdoodles then you should seriously go make these cookies right now. You can easily polish off four or five before you know it. I am not saying that happened to me, but it most likely did. These are the perfect Fall cookie and they don't have too strong a pumpkin flavor for those folks who claim to not like pumpkin. For those of you are here for the give away, skip to the bottom of the post. In other news, the adorable clothing company Shabby Apple has decided to pair up with Baked Perfection to offer you, my readers a great giveaway and a coupon for 10% off. They have such adorable clothes and want to give one of you this dress (Click on the picture to go to the webpage). I had quite a bit of fun sorting through their website today picking out things I want. If you want to use the coupon all you have to do is use the offer code: bakedperfection10 at checkout. To enter the give away all you have to do is leave a comment before midnight on Friday, October 28th. I will announce the winner on the 29th. Be sure to leave your email address with the comment so I can contact you to get your dress size. In the meantime, happy shopping! Another seasonal cupcake for you. If you follow me on facebook then you know I was making cakes for a friend's wedding yesterday. one of the flavors she chose was Apple Cake with Cream Cheese Frosting. This is the cupcake I served her when I had her over for a tasting. 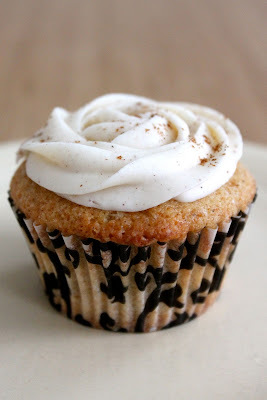 I love these cupcakes with both the Caramel Buttercream and Cream Cheese Frosting. The Caramel Buttercream is rich and sweet and the Cream Cheese Frosting is smooth and tangy. If those two frostings aren't enough for you, perhaps try Peanut Butter Frosting. I have to admit that I never actually thought to pair this Apple Cake with Peanut Butter Frosting, but it makes perfect sense. I had another set of friends over for a cake tasting and the Apple Cake with Peanut Butter Frosting (which was their idea) ended up being their favorite. Just reminds me sometimes I need to open my eyes a little wider. Either way, this is a delicious cake that should definitely be included in your Fall recipes. 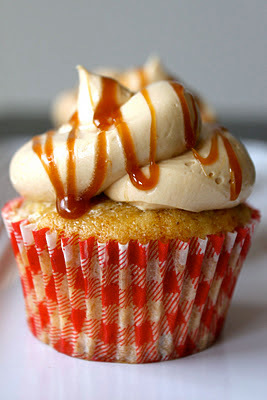 I have included the recipe to the Caramel Buttercream below. Here are links to my Cream Cheese Frosting and Peanut Butter Frosting. In a large bowl mix together the flour, baking powder, cinnamon, and salt. In a separate bowl, beat together the eggs and sugars until creamy. Beat in the the orange juice, vanilla, and vegetable oil. Slowly add the flour mixture, mix until just combined. Stir in the grated apples. Bake 20-25 minutes until a toothpick inserted into the center comes out mostly clean. Cool completely before frosting. **Bakers Note - I prefer to use a mix of sweet and sour apples. For my latest batch I used a mix of Granny Smith and Macintosh. Place whites and remaining 1/2 cup sugar in a heatproof mixer bowl set over a pot of simmering water. Whisk until sugar dissolves and mixture registers 160 degrees on a candy thermometer. Remove from heat, and attach bowl to a mixer. Whisk on medium speed for 5 minutes. Increase speed to medium-high, and whisk until stiff, glossy peaks form, about 6 minutes. Reduce speed to medium, and add beaten butter, cup at a time, whisking well after each addition. Whisk in vanilla. Switch to paddle attachment. With mixer on low speed, add caramel, and beat until smooth, 3 to 5 minutes. 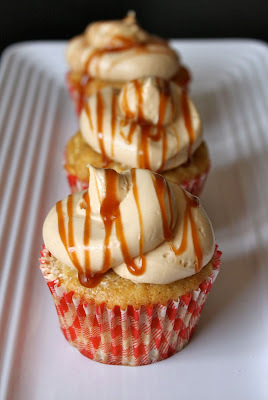 **Bakers Note - When I made the caramel I doubled the recipe and used the leftover to drizzle caramel over the cupcakes. You will still have some leftover which is great on ice cream! Cupcakes to welcome my favorite season. I love Fall. It is far an away my favorite season. I anxiously await every year for the heat of summer to break and the leaves to change. For the record, summer is my least favorite season. It appears Fall has finally arrived in the DC area. The air has a cool crispness and the leaves are starting to get their first hint of orange. I love it. These cupcakes are the perfect addition to welcome in my favorite season. They are not pumpkin, which is very traditional for Fall, but include the warm spices and make your house smell incredible! I promise to post some pumpkin recipes this Fall but in the meantime you should really give these a try. I made half with raisins and half without...as you know if you have been following this blog for a while that I am definitely not a fan of raisins in my food. 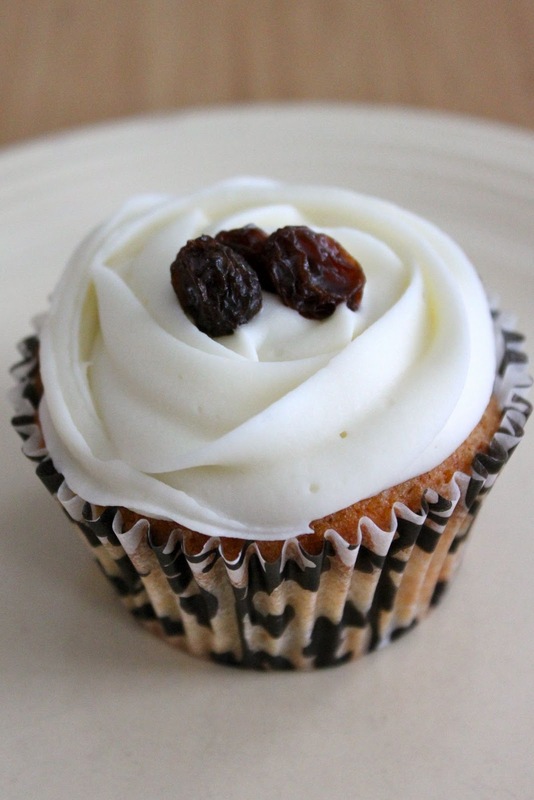 The raisins add additional sweetness and actually change the flavor profile of the cupcakes. I took a poll and people seemed to love both so it is really personal preference. Preheat oven to 350 degrees Fahrenheit. Fill cupcake pan with paper liners and set aside. In a small sauce pan bring 2 cups of water to a boil. Place raisins in boiling water and reduce to simmer. Simmer for 3 - 5 minutes and drain. Set raisins aside. In a small bowl whisk together the flour, baking powder, salt, ginger, cinnamon, nutmeg, cloves, cardamom, and orange zest. In a separate bowl combine the buttermilk, beaten eggs, and vanilla extra. In a large bowl beat together the butter, sugar, and brown sugar. Slowly add the flour and milk mixtures alternating between the two until just combined. Gently fold in the raisins. Pour batter into prepared cupcake tin. Bake 20-25 minutes until a toothpick inserted into the center comes out mostly clean. Cool completely before frosting. Beat butter and cream cheese with until fluffy, 2 to 3 minutes. Slowly add sugar, 1/2 cup at a time. Add salt, cinnamon, and vanilla; beat until smooth.